ThermaTech was used to clean one of the historic white Wiltshire Horses at Westbury, just in time for the 2012 Diamond Jubilee. Read more about this epic British landmark and how we helped restore its brilliant white gleam. The horse, known locally as the Westbury or Bratton White Horse, sits on the Salisbury plains just below an old Iron Age fort known as Bratton Camp. Carved into the hillside in the 17th century, the Bratton White Horse is one of the oldest of the Wiltshire Horses (the top spot going to the Uffington Horse that can trace its genesis back to the 11th century). Wiltshire's dramatic horse carvings excite much interest and local affection, beautifully adorning the green countryside with their white splendour. 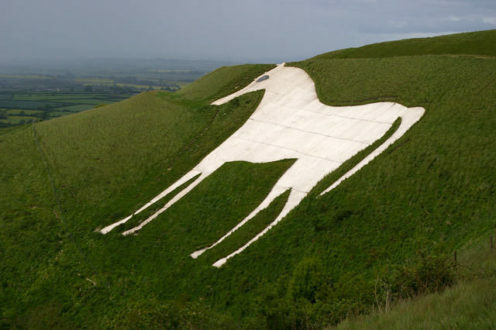 It is so loved by locals that the white horse has now become a symbol for Wiltshire itself! It is thought that the Bratton Horse was initially carved to commemorate the Battle of Ethandun, reported to have taken place in AD 878 in the adjacent Bratton Camp. In the 17th century white horses were understood to be symbols of Christian (Saxon) victories over the Danes, and carving them into the hillside was seen as a way to celebrate the early unification of Christian Britain. A stunning example of an Iron Age hillfort, Bratton Camp lies immediately adjacent to Bratton Horse and was first excavated in the 18th century. The original Bratton settlement would have contained a mixture of houses, granary stores and workshops- all protected by the hillfort defences. Hillfort defences were built in a culture of intimidation and were designed to show off your power to approaching enemies and rivals. It is thought that these Bratton defences were originally built over 2,000 years ago! Cut into chalk, restoring Bratton Horse's brilliant white gleam is no mean feat. Originally, the Horse was repeatedly scoured to maintain its chalky white surface; the last time we know of this happening was in 1853. However, from the 1950s onwards, a more pragmatic approach was taken and the Horse was entirely covered in concrete that was then painted white. Sadly, concrete can be hard to maintain, especially in wet and windy conditions, and the Bratton Horse needs periodic restoration and maintenance. A lot of the dirt and streaks come from the resoiling of the structure, compounded by rainfall then washing other parts of the Horse clean. Restorative Techniques were first called to the scene back in 2012 when the Westbury Rotary Club led by Steve Carrington cleaned the Horse using ThermaTech (See the BBC News article here). The 2012 restoration was the first of its kind undertaken since 2006. The cleaning of the Horse was part of the Queen's Diamond Jubilee celebrations, culminating with the Horse being lit up with searchlights. ThermaTech was selected for the cleaning job because of its unique capability, the tricky location, the cleaning task at hand and crucial SSSI considerations. To see how the job was done - check out this ITV video to see the cleaning of Bratton Horse in action.